Salt is one of the most important body component for humans to live on, however Today Americans consume too much salt, now the degree of overdose of sodium is threatening our health, I grew up in East Asian Country, although living in this country over a decade, still most of the restuarant food is salty, at times I couldn’t eat. This morning reading this report and the article written by MIKE STOBBE, AP Medical Writer, I am posting this to share the good information. The salt in our foods and table salt is made up of sodium and chloride. 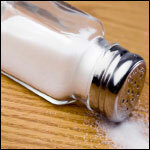 Too much sodium is bad for your health and can increase your blood pressure and risk for a heart attack or stroke. Learn how you can reduce sodium in your diet. Most of the sodium we consume is in the form of salt. Too much sodium is bad for your health. It can increase your blood pressure and your risk for a heart attack or stroke. Heart disease and stroke are the first and third killers of men and women in the United States each year. Current dietary guidelines recommend that adults in general should consume no more than 2,300 mg of sodium per day. However, if you are in the following population groups, you should consume no more than 1,500 mg per day. You are 40 years of age or older. A new CDC report shows that two out of three (69%) adults in the United States fall into these three groups who are at especially high risk for health problems from too much sodium. Eating less sodium can help prevent, lower, or even control blood pressure. Most of the sodium we eat comes from packaged, processed, store-bought and restaurants foods. 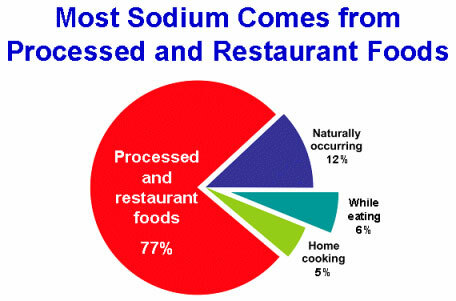 Only about 5% comes from salt added during cooking and about 6% comes from being added at the table. You can find out how much sodium you are eating by checking the labels on food products and adding up the milligrams of sodium. If at a restaurant, ask for the nutritional information facts that include sodium. Source: Mattes, RD, Donnelly, D. Relative contributions of dietary sodium sources. Journal of the American College of Nutrition. 1991 Aug;10(4):383-393. The Dietary Approaches to Stop Hypertension or DASH eating plan is a simple heart healthy diet that can help prevent or lower high blood pressure. This diet is LOW in sodium, cholesterol, saturated and total fat and HIGH in fruits and vegetables, potassium, fiber, and low-fat dairy products. Making other lifestyle changes, like getting more physical activity, while on the DASH eating plan gives you the biggest benefits. See Your Guide to Lowering Your Blood Pressure with DASH to learn more about the DASH Eating Plan. Know your recommended limits for daily sodium intake. Choose foods like fresh fruits and vegetables. Read the nutrition label of the foods you purchase. Ask for foods with no or low salt at restaurants. With two out of three adults at risk for health problems from too much sodium, you probably know someone who needs encouragement to change his or her diet. Send an eCard about lowering salt intake.